The best new Pop-Tart to come out in the last 5 years. Pumpkin Pie Pop-Tarts deliver. They actually taste like pumpkin pie. They may only be around for a short time, so I recommend giving them a try. For best results, toast each Pop-Tart on low twice. When the crust is golden brown and warm, it will remind you of a pie crust. The filling is what you would expect... it tastes like a thin layer of pumpkin pie filling. 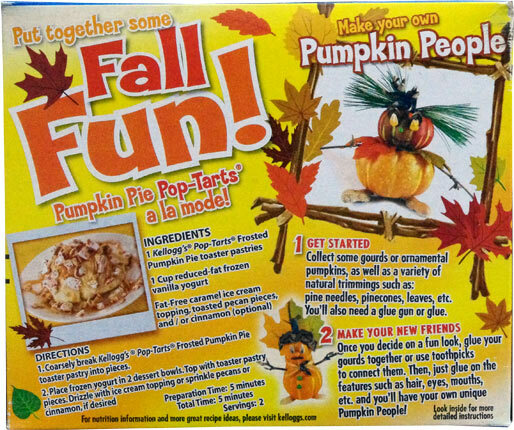 If you like pumpkin pie, this product is an early holiday present from Kellogg's. Of course... you should treat all Pop-Tarts like treats. Their high sugar content and almost complete lack of dietary fiber put them in the same category as donuts... a no-more-than-once-a-week guilty pleasure for times when you deserve to indulge. But if you must indulge, this is a good way to go. Nutritional considerations: Each single pastry serving has 200 calories, 5 grams of total fat, 1.5 grams saturated fat, 0 grams trans fat, 0 mg cholesterol, 35 grams total carbs, less than 1 gram dietary fiber, 16 grams sugar and 2 grams protein. 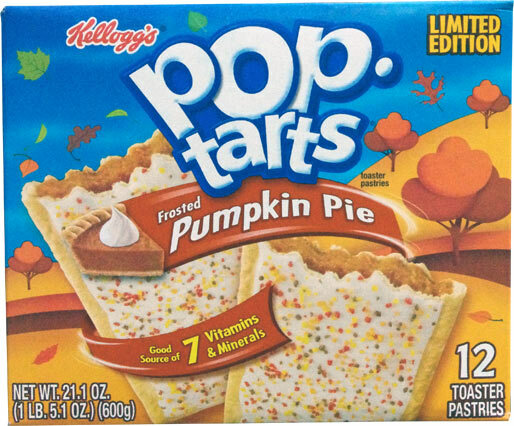 What do you think of Pumpkin Pie Pop-Tarts? These Pop Tarts are really good and they do taste like pumpkin pie. These tasted like pumpkins. Much like my grandmother used to make back on the farm. <3 Peace and blessings. Could this POP-TART make the Top 2..... you know it. It Now goes Cinnamon, Pumpkin Pie followed by Cherry. Down 1 spot from #2 is Cherry. 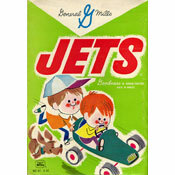 It may actually be my favorite flavor; however it is not an everyday eater and that is why cinnamon is still numero uno. BTW, the schmucks on Amazon are charging like 15 bux a box. 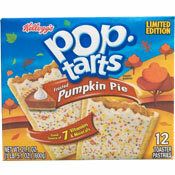 Can Whitehorse Yukon get these pumpkin pop tarts?? I ordered these from Amazon because local grocers didn't carry them and target ran out. Highly recommended, when toasted it does taste exactly like pumpkin pie and the filling reminds me of pre-cooked pumpkin pie batter. Just enough spice to not overwhelm the pumpkin and the icing is nice to even things out. As Poptarts go, these are the SHIZZY!! !